Posted by starsandcars in sports. Sachin Tendulkar is likely the most popular sports figure in India and his skill playing cricket has been much admired throughout the world. 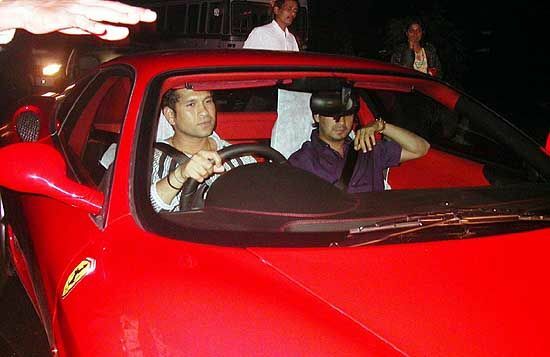 When Tendulkar hit his 29th century, Ferrari decided to celebrate the milestone by giving him a Ferrari-360 Modeno. However, there was one snag. The import duty for the vehicle’s entry to India would be a whopping $350,000– more than the cost of the car itself! The cricketer applied for a wavier which the star-struck court promptly granted. This lead to a to a firestorm of protest across the country, with many complaining that Tendulkar was being given special treatment by the authorities. The debate raged and many citizens, while agreeing the fee was high, were outraged that a star could be considered above the law. Fiat, Ferrari’s owner (and the brand officially endorsed by Tendulkar) finally stepped in offering to pay the tax and end the controversy.